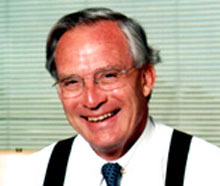 Congressman and former CIA agent, Porter Goss briefly replaced George Tenet as CIA Director in September 2004, only to resign himself in May 2006. Formerly the chairman of the House Intelligence Committee, Goss is an ardent Republican with strong loyalty to President Bush and a proven willingness to take orders. After receiving a phone call from the White House in October 2002, Goss publicly declared his opposition to the creation of an independent 9-11 Commission. A year later, he declined to open committee hearings into the Valerie Plame leak, saying: "Somebody sends me a blue dress and some DNA, I'll have an investigation." Predictably, Goss chiefly blamed President Bill Clinton for the CIA's failures in recent years. He confided in a reporter: "The one thing I lose sleep about is thinking what could I have done better, how could I have gotten more attention on this problem sooner." When asked whether he ever brought up his concerns with the administration, Goss claimed he had met three times with President Clinton to discuss "certain problems". The upshot? "He was patient and we had an interesting conversation but it was quite clear he didn't value the intelligence community to the degree President Bush does." "Congressman Porter Goss might finally get his wish and become the new DCI, but if he does not demand a public commitment from the President, to a National Security Act of 2004-2005, with the full support of the Appropriations, Armed Services, Commerce, Foreign Affairs, Government Operations, Intelligence, and Judiciary committees on both sides of the Hill, then Porter Goss will tread water and then drown, just like the last five DCIs." Goss resigned abruptly on 5th May 2006.